She's going the entire distance from Winter Quarters to Salt Lake City during the 1997 Heritage Gateway Wagon Train Re-enactment. I am a 24 year old "pioneer boy" from Scottsdale, Arizona. I graduated in April from Brigham Young University with a degree in Biochemistry, and will be going to graduate school in the fall of 1997. I enjoy making new friends, science, hiking in the Utah and Arizona mountains, running marathons, classical music, hanging out with my buddies, and spending time with my family. 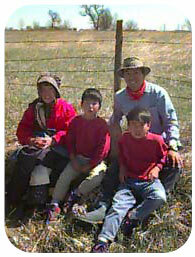 Osamu is on the wagon train with his family. 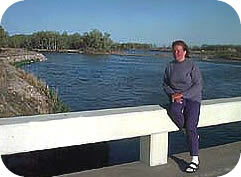 Wendy is part of the authentic camp, sleeping and eating much as the original pioneers. She's also shuttling the laptop computers between the Whitaker family and Margaret, as well as gathering up answers to the questions asked by students at this site. 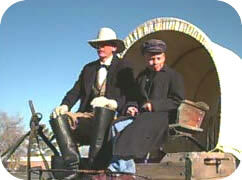 Daniel is in fifth grade and will be traveling with his family on the Mormon Trail Trek. He is busy with chores and will ride a horse and walk.